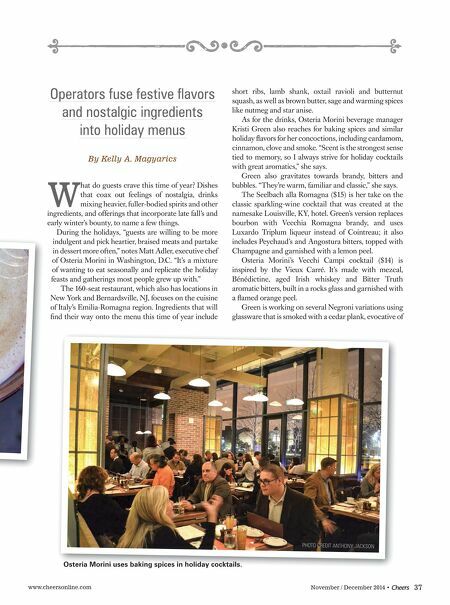 www.cheersonline.com 37 November / December 2014 • Operators fuse festive fl avors and nostalgic ingredients into holiday menus By Kelly A. Magyarics W hat do guests crave this time of year? Dishes that coax out feelings of nostalgia, drinks mixing heavier, fuller-bodied spirits and other ingredients, and offerings that incorporate late fall's and early winter's bounty, to name a few things. During the holidays, "guests are willing to be more indulgent and pick heartier, braised meats and partake in dessert more often," notes Matt Adler, executive chef of Osteria Morini in Washington, D.C. "It's a mixture of wanting to eat seasonally and replicate the holiday feasts and gatherings most people grew up with." The 160-seat restaurant, which also has locations in New York and Bernardsville, NJ, focuses on the cuisine of Italy's Emilia-Romagna region. Ingredients that will fi nd their way onto the menu this time of year include short ribs, lamb shank, oxtail ravioli and butternut squash, as well as brown butter, sage and warming spices like nutmeg and star anise. As for the drinks, Osteria Morini beverage manager Kristi Green also reaches for baking spices and similar holiday fl avors for her concoctions, including cardamom, cinnamon, clove and smoke. "Scent is the strongest sense tied to memory, so I always strive for holiday cocktails with great aromatics," she says. Green also gravitates towards brandy, bitters and bubbles. "They're warm, familiar and classic," she says. The Seelbach alla Romagna ($15) is her take on the classic sparkling-wine cocktail that was created at the namesake Louisville, KY, hotel. Green's version replaces bourbon with Vecchia Romagna brandy, and uses Luxardo Triplum liqueur instead of Cointreau; it also includes Peychaud's and Angostura bitters, topped with Champagne and garnished with a lemon peel. Osteria Morini's Vecchi Campi cocktail ($14) is inspired by the Vieux Carré. It's made with mezcal, Bénédictine, aged Irish whiskey and Bitter Truth aromatic bitters, built in a rocks glass and garnished with a fl amed orange peel. 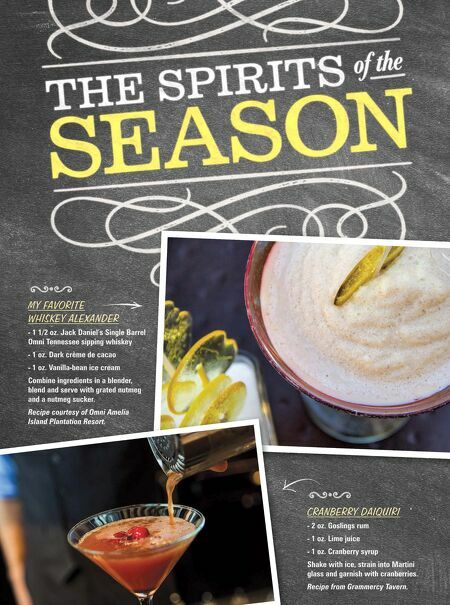 Green is working on several Negroni variations using glassware that is smoked with a cedar plank, evocative of PHOTO CREDIT ANTHONY JACKSON Osteria Morini uses baking spices in holiday cocktails.